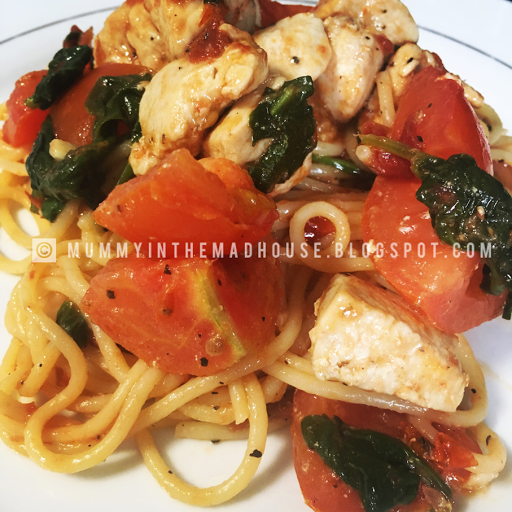 Tomato Basil & Spinach Chicken Spaghetti – healthy, light, Mediterranean style dinner, packed with vegetables, protein and good oils. Delicious comfort food! What makes this pasta very special is that in addition to fresh tomatoes, basil, garlic, and spinach, I also used sun-dried tomatoes and red pepper flakes to add lots of flavor! Once the dish is completely cooked, I highly recommend that you add 3 tablespoons of high quality olive oil to stir into the final dish, off heat. 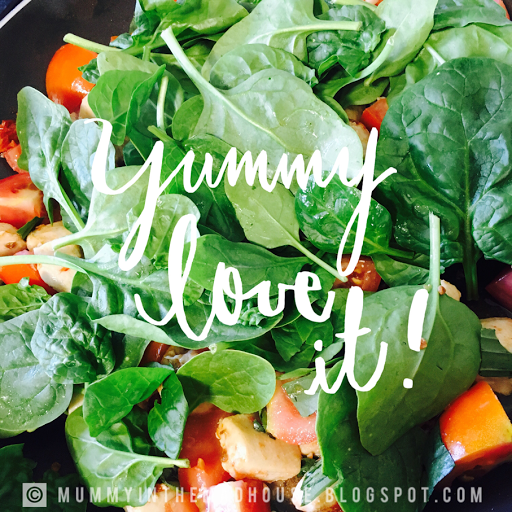 It’s so tasty and so good for you! This dish takes 10 minutes prep time & 30 minutes cooking time, a perfect quick midweek meal for all the family to enjoy. Heat a skillet on a medium-low heat, add the 2 tbsps of oil drained from the sundried tomatoes, heat till hot then add the sundried tomatoes, chicken, red pepper flakes & salt. Turn the heat up to medium & cook until the chicken has cooked through. About 5 minutes. Once chicken has cooked through, add the tomatoes, basil, spinach & garlic, cook for about 3-5 minutes until the spinach wilts just a little & the tomatoes release their juices. Remove from heat & cover with a lid. Keep off heat. Cook the pasta according to the package instructions, once cooked drain then add the spaghetti to the skillet with the chicken & vegetables. Reheat on a low heat, mix everything in well & salt & pepper to taste. Remove from heat. At this point, when the pasta & veg are off heat, add the 3 tbsp of high quality olive oil, which is really tasty. Or you can add more olive oil from the sundried tomatoes. This really was a tasty dish, so quick & easy to make & seriously substantial!